We're going on a brunch hunt. We're going to catch a big one. What a beautiful day. We're not scared. We've been here before. Indeed we have a couple of years back when this was still the Kai Bar. P'raps those "good value" meals were too good to be true since the Kai ist kaput. Now mighty Mike Keen -- you may know him from the Barclay's newspaper ads, or more likely from the Brewery Tap -- has stepped in. Behold, rising like Conchita, the Cult Cafe: what's the Wurst that can happen? Before I can order it, Andy goes for the "steamboat short rib burrito" leaving me with the "cajun catfish tacos", straight from the LEGO Movie. Combined price of £13 for two piled plates of well-presented protein. Agreeing to share doesn't make our portions any smaller. Yum-yum and then some. Absolutely stuffed, a fact that somehow escapes me when Andy offers to buy dessert. Surprise me, I said, before a walloping iced cupcake appears in front of me. Officially approaching 130% full with one eye on the badminton players jumping about on the (muted) Commonwealth Games telly. Fuller than Fulton Mackay or Rikki Fulton. All this, with money off for UCS folk, and an ever more impressive list of up and coming gigs. Turin Brakes in a month's time, The Vitamins not long after, oh, and the world pickled egg championship. There's class. 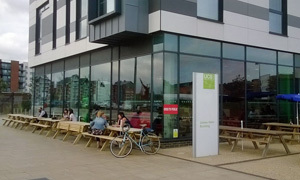 Thought: could the Cult Cafe be Ipswich's own waterfront version of The Alex? By the way, that's high praise. If it was a car -- Jensen Healey. If they were passing by -- George O'Dowd.